The Ext-js library has a portal example here. If you play around with that, you can see that the "portlets" move vertically when you drag and drop. It is a frequent requirement, instead, that the portlets dispose horizontally. a. Create a outer div with a fixed width, say 700px. Set "overflow:auto" in the outer div. b. Create a div within it. Identify this div as, say, innerDiv. So, the key idea is that the inner div's width is set dynamically, depending on the number of portlets contained within. This also works if you have to add portlets on click of a button. 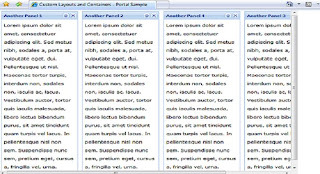 With the above steps you can create a scrollable container, with portlets laid out horizontally. Thus, within the inner Div, I have a "ul" and add the portlets as "li"s one by one. The last line, is meant for drag and drop - as covered next. I completely bypassed Ext. Since the above list can be considered a sortable list, I simply created a Sortable object on the ul. This single line enables drag and drop. More details can be found here. Hi...nice post...can you post the working code of this example..